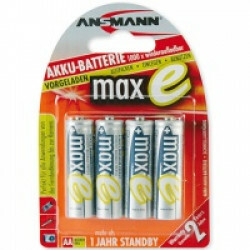 Ansmann maxE rechargeable batteries are the new range of Ready-to-Use or Pre-Charged rechargeable batteries. They are fully charged on purchase and can be used straight from the pack. The other huge advantage of Ansmann maxE batteries is their low self-discharge rate. This means they do not lose their charge as quick as ordinary rechargeable batteries, in fact they will stay charged for up to 12 months. These Ansmann maxE AA rechargeable batteries are NiMH (Nickel Metal Hydride) and have a high capacity of 2100mAh. We sell these in packs of 4.